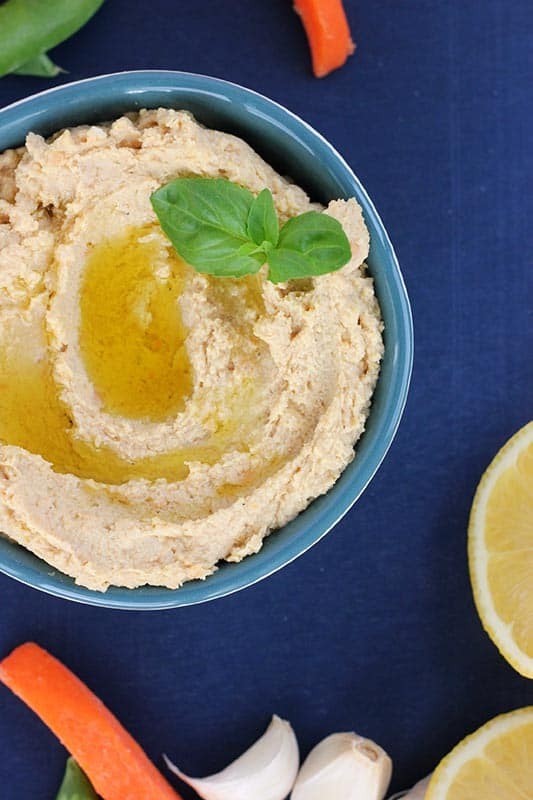 Easy Homemade Hummus Recipe. Cooked chickpeas pureed with tahini, fresh garlic, and a splash of lemon juice! The perfect homemade healthy snack. Believe it or not, this is the very FIRST time that I have made my own hummus. How insane is that?! This is one of those afternoon snacks that is always a favorite but one that I never even imagined would be as simple to make. All you need are quality ingredients and a high powered blender or food processor. 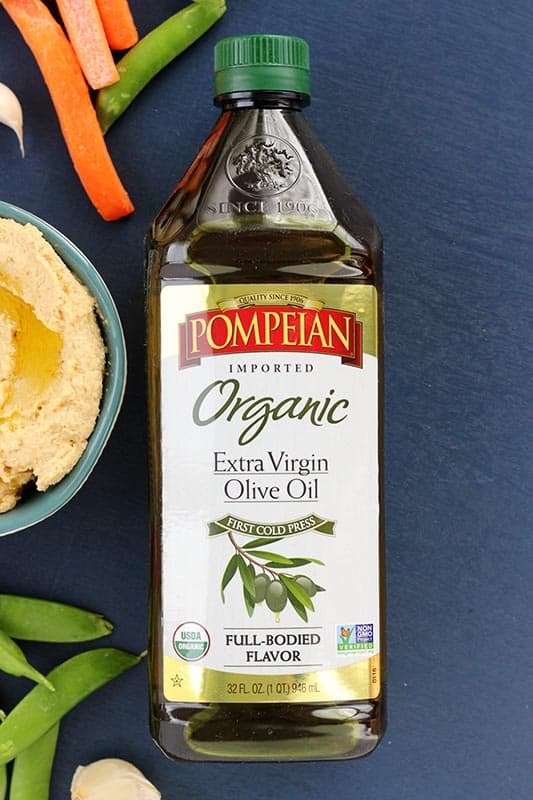 The very first thing I did was reach for Pompeian Organic Extra Virgin Olive Oil. 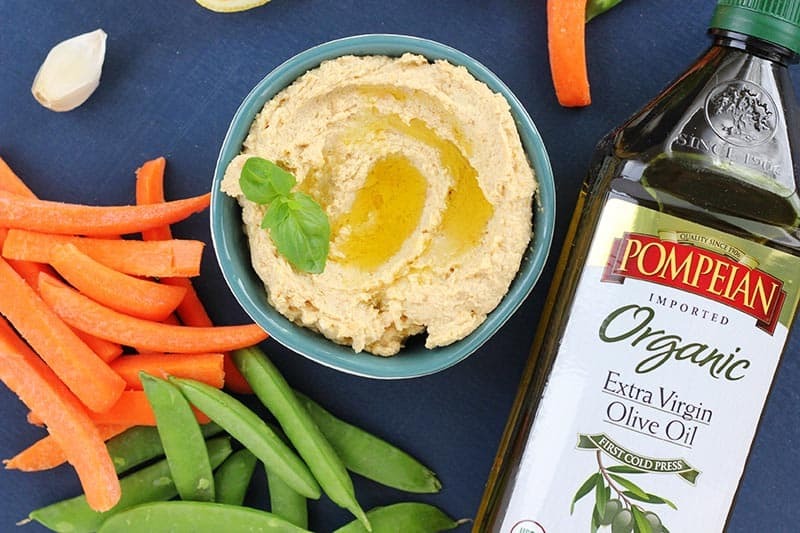 Its robust flavor is the perfect base to our dip and paired well with the middle eastern flair of the recipe! I mixed together a little oil with tahini and garlic for this perfect recipe! 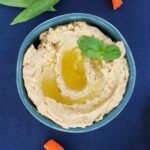 Being a newbie to the hummus party I had a few questions before I got started. First, how creamy does this need to be? Are we talking peanut butter texture? Apple Sauce? What’s the perfect balance?? And second, how much is too much spice? Good news is I have an amazing Instagram following and you all were quick to offer advice. Turns out the happy medium for texture is somewhere between peanut butter and apple sauce. As for the spices? It all kind of depends on you. We added all of our ingredients into the blender, gave it a little taste, and adjusted the salt and pepper to taste. I was pretty heavy handed with the salt and thought it came out perfect. Like this recipe? You will love my Cinnamon Honey Yogurt Dip, Taco Dip, and Cilantro Lime Skewers! Combine the first 5 ingredients in a food processor or blender. Pulse until creamy. Add the cumin, salt, and pepper to taste. If your hummus is too thick and a tablespoon or two of water.